Estimated value (2016): $1.3 million *Based on sold values of similar paintings and adjusted for inflation. In the 1950s and 1960s, the world of American art was dominated by Abstract Expressionism, a movement that focused on spontaneity and the abstracts rather than realism or even surrealism. This type of art can be overly complex, emotional and rebellious. Movements like Photorealism and the New Realism arose in the late 1960s to counter Expressionism. Richard Estes was a leader of the Photorealism movement, which sought to bring realism back to the mainstream. Gordin's Gin is a liquor brand originated from the UK. It entered the U.S. market in 1934 and became popular in the 1960s. Estes' painting was set in Times Square, New York. At first glance, this artwork looks like an old photograph of a typical 1960s big-city street filled with signs and advertising billboards. But don’t let the realistic details fool you; this ‘photo’ is actually an oil painting. To achieve the realistic details, Estes photographed a real street scene and reproduced the scene exactly as it appeared in the photograph. By doing so, Estes hoped to capture the essence of contemporary America. 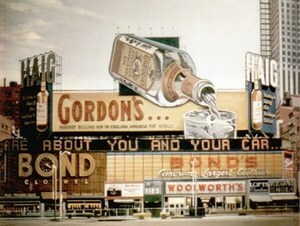 There were drastic changes to American social landscape at the time and they are inherent in this painting of a giant whiskey billboard. This realistic scene is a direct contrast to the surreal and somewhat disturbing world of emotions and colors found in abstract art. Photorealism is the country music of art, while abstract expressionism is the rock and roll.